Sometimes it’s just easier to install things yourself in your home. It’s a great way to save money and to learn a thing or two. Flooring can be a very expensive project during your home improvement phase. Generally the most expensive part is the labor behind it. Don’t be surprised if half of the cost goes to paying someone to install it. However, what if we told you that you can get the beauty and durability of cork flooring and install it yourself with ease? I bet you’d say tell me more, and so we shall. 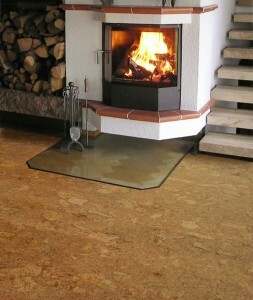 This magic product is called cork floating floors. Floating floors, unlike the type that are nailed or glued, simply float on top of your sub-floor, in fact the worse condition your sub-floor the more likely floating cork floor is your best cork floor type. You can even install it over old vinyl tiles or sheet vinyl. You can use a floating floor over concrete but you’ll need a moisture barrier to prevent mold or mildew from growing on the concrete. The floating cork system is basically “click it and forget it”. The floor sits on top of the base and takes a lot less time to install. If you have radiant flooring heat this is also an excellent flooring system since it can expand and contract as one single unit. Natural stone flooring is hugely popular for use in commercial premises; this effortlessly promotes an air of distinction and sophistication and shows a level of class. Stone is used in a variety of ways in business; whether it is floor tiles, fireplaces or countertops. Although varied in its use, there is one common factor that is inevitable; over time, through use, it will require restoration. The porous nature of natural stone and the individual requirements of different stone types proves why it is imperative to seek the assistance of a professional stone cleaning and restoration expert. These specialists have the in-depth and detailed knowledge of the stone make-up, the products that complement their restoration and the industrial machinery to offer a cost-effective and efficient service. This will reduce disruption to your business. So what is involved in this intricate process? Step 1: an inspection will be completed on-site. From this an accurate quotation will be able to be drawn up, providing an opportunity to discuss timescales and possible limitations. It is important, at this point, to discuss any business commitments that would affect the restoration process. Step 2: on commencement of the work, all walls, skirting and furniture should be thoroughly protected. Every element of the stone cleaning and restoration process should provide you with confidence that you are dealing with a professional outlet. Step 3: all dry dirt, particles and soil are removed from the surface of the stone. Step 4: a stone-specific, pre-mixed cleaning solution is applied. Damage can very easily occur at this stage if an individual has insufficient knowledge of natural stone’s requirements. Your chosen specialist should have evidence on their website of previous training completed and accreditations gained in the stone cleaning field. Step 5: state-of-the-art rotary cleaning machinery is then used to agitate the pre-mixed solution. This machinery reaches into edges, corners and hard to reach areas, ensuring the stone flooring is evenly and consistently cleaned. Step 6: the entire area is then rinsed. If there is evidence of any stubborn staining, the cleaning process may need to be repeated and rinsed. Step 7: the stone floor is then required to be thoroughly dried; fast-drying machinery is available to best-served professionals which drastically reduces drying times. Step 8: the stone tiles are then polished using diamond encrusted rotary pads. The initial pads are course and work down to a fine pad which produces a smooth and reflective finish. The level of polish is fully discussed prior to work starting as it may be that a honed finish would be chosen rather than a high-sheen. Step 9: a stone-specific sealer is then applied to the stone. This process is usually completed by hand to ensure entire coverage. 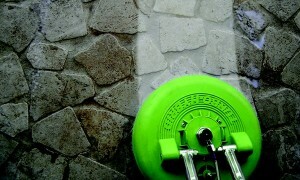 A stone sealer will penetrate below the surface and will work to repel any future liquid spillages. It provides a natural resistance, however, it is strongly recommended that any liquid on any stone surface should be mopped up as soon as possible to reduce the likelihood of staining. This is an incredibly rewarding process that can bring extremely dirty and damaged stone back to life. Evidence available showing before and after pictures only show testament to this. Restoring stone flooring, countertops and fireplaces within your commercial setting will provide clientele with the correct opinion of your business and will undoubtedly beaming with your gleaming natural stone! If you are planning to re-tile a bathroom or kitchen then one of the main factors affecting which tiles you choose is how they look; are they the right colour, texture and size to create the look and feel that you are after? And, of course, do they fit with your budget as well as your design ideas? But there is more to a wall or floor tile than how they look and feel; no matter how beautiful a tile might appear it will not be suitable if it doesn’t meet the requirements of your installation. For example, if you plan to use floor tiles in a wet-room are they slip resistant? Safety should always be a consideration when tiling a floor. So it is worth checking out the technical information available with the tiles; it is not just boring details that are of no concern to you this stuff will help you make a choice that proves to be safe and durable enough for a particular environment as well as one that looks great. Firstly, what are the tiles made of? It is not uncommon for consumers to refer to all wall and floor tiles that are not made from natural stone as “ceramic”. And whilst, technically, this may be true there is a big difference between the manufacturing processes for traditional ceramic tiles and the more technologically advanced processes for making porcelain tiles. There is confusion with the terminology because both types of tile are made from clay or from a clay mixture but that is where the similarity ends because the different manufacturing processes produce a quite different end product. There is a marked difference between how much stronger, more hard-wearing and more frost resistant a porcelain tile is compared to a ceramic tile. 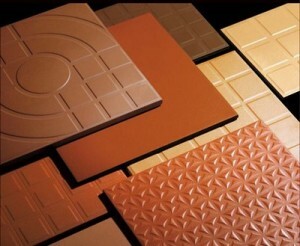 To produce a ceramic tile the mixture of clay and water is shaped into a tile, which is then fired in a kiln. A glaze is then applied to the surface to produce the desired colour. Whilst not as strong or hard-wearing as porcelain tiles they are still perfectly suited to domestic installations and particularly for tiling walls. Porcelain tiles on the other had are produced by mixing the clay with coloured minerals and finely milling it. The shaped tile is then created by pressing the mixture into moulds under high pressure. The kiln firing is then done at an extremely high temperature and this process results in a dense and very strong tile. Some porcelain tiles are glazed in the same way as ceramic tiles but many are now “full-bodied” which means they have the colour and pattern running throughout the tile rather than just as a surface layer on top. The advantage of a full bodied tile is that any chips or damage to the tile will be less noticeable because the chip will not reveal a clay coloured base layer. But even glazed porcelain tiles are much more durable than their ceramic cousins. Another advantage of using porcelain tiles in the home is that they are also highly waterproof so are perfect for today’s modern wet-room style bathrooms. The fact that they are waterproof also means that they are highly frost-resistant so some types are suitable for outdoor use; but do check this with the supplier as some types are not. Most porcelain tiles will be graded for the most suitable type of use so make sure to check the PEI rating on any tiles you are considering buying: 0 means they are the most fragile and only suitable as wall tiles and 5 means they are suitable as floor tiles in both residential and commercial settings.